For the last few months I have been sharing my monthly goals with you and setting monthly goals is proving to be very successful. Back in November, my goals were to be more productive and organised. I felt like my productivity had slipped considerably during the end of my pregnancy and looking after a newborn, quite understandably. Sometimes you do need to take it easy and have a break for a while. However, after having a break, it can be really difficult to get back into things. Therefore, setting yourself goals can be helpful. My goal for December was to knit. A simple goal that was easy to achieve with a few adjustments in the way I spent my time. 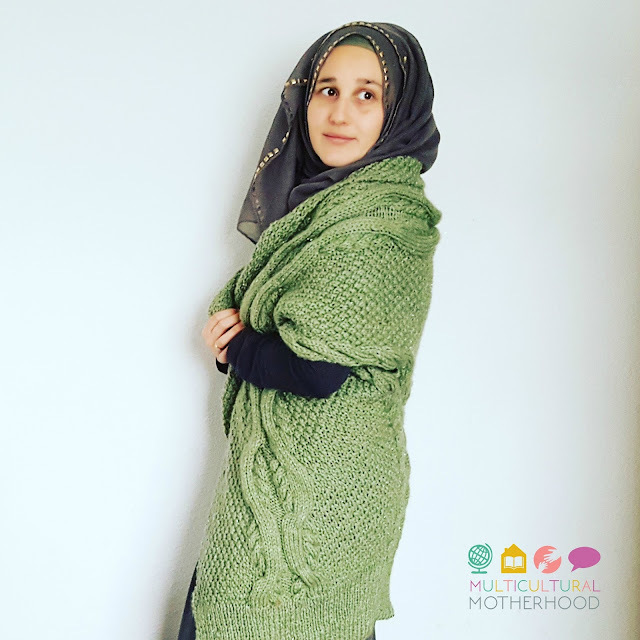 Last month I wrote about the amazing health benefits of knitting; there is much more to it than being creative and making clothing. I have noticed myself becoming more relaxed over the last month as I work on my knitting in the evenings. It is a great way to unwind and I am thrilled that I was able to complete a cardigan for myself that I had begun one year ago. It feels so satisfying to complete a project and even more satisfying being able to wear something I have made myself. I even got round to starting a new knitting project and I am pleased to say I am already half way through! I cannot wait to finish this one as it is quite different to what I usually wear. I also have a third knitting project lined up which I am looking forward to getting on my needles. So what am I planning to work on this month? This month seems to be a particularly special month as it is also the start of a new year. I feel like I should start as I mean to go on, so I need a goal that is important to me. Because of this, I have chosen a goal that I have been meaning to accomplish for many many years. This is to learn Turkish. I have always been passionate about learning languages. At school, language lessons were my favourite subject. I even enjoyed grammar. In fact, I love to understand how different language systems work and look at the similarities and differences between them. When I was younger I had a flare for learning vocabulary and used to love memorising vocabulary lists. I studied four languages at school; French, Italian, German and Latin. Then I went on to study French and Italian A levels at college. However, I did not continue with languages at university, I studied Speech and Language Therapy instead. After that, my language learning continued in a different form. I met my husband, a Kurd from Turkey, and I began to learn Turkish which is the language he uses most often. There were no language classes, it was purely self-study and immersion learning. My Turkish is reasonably good. I am able to hold a conversation and understand most things. When I look back, I wonder how I learnt it. I did not spend much time sitting down learning vocabulary lists like I once did. I somehow seem to have acquired it without much trying. But the problem is, this has got me to a certain level in which I have remained, without much progression, for a long time. I know I need to improve my Turkish language skills and this will take effort and dedication on my part. Finally, the time has come for me to commit. In fact, I should have done this years ago but I never seemed to find the time to do it. I had so much to learn already due to my university studies at undergraduate and postgraduate level. Now I am no longer a university student, I feel able to devote my time to languages. So how am I planning to do this? Learning new words every day is going to be key to my language learning success. I will aim to learn at least 10 new words each day, both on their own and within a phrase. In the book 'The Art and Science of Learning Languages', the authors Amorey Gethin and Erik V. Gunnemark suggest writing new vocabulary on a piece of paper which you keep in your pocket. You can then look at the vocabulary and phrase lists throughout the day whenever you have a few minutes spare. Gethin and Gunnemark also talk about the importance of not just learning words on their own but within a phrase. It is much more useful to learn words in the context in which they are used. Another particularly useful resource in this book is the essential vocabulary list in an appendix at the back of the book. The authors state that if you know the essential 500 words in any language, you will be able to converse with people in that language. I am going to try it and see! 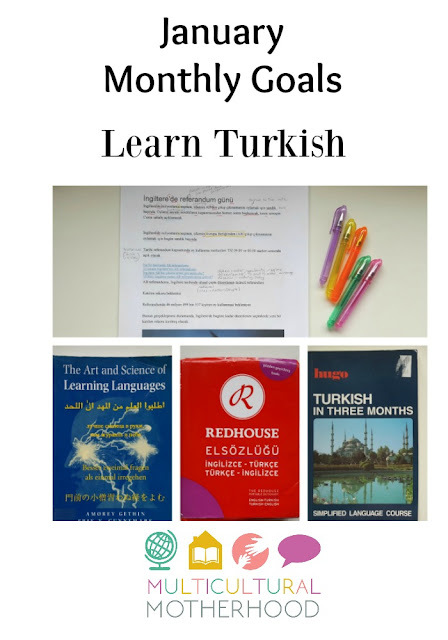 I am going to use the book 'Learn Turkish in Three Months' by to base my learning on. As I am not a beginner, I am not sure how useful this book will be but I hope it can help me bridge some gaps in my knowledge. I will go through it learning any phrases that are new to me. I am planning to spend time each week reading Turkish. The most useful thing I have done in the past to increase my reading skills is to read news articles. Therefore, I will print articles from a Turkish news website and practise reading them. 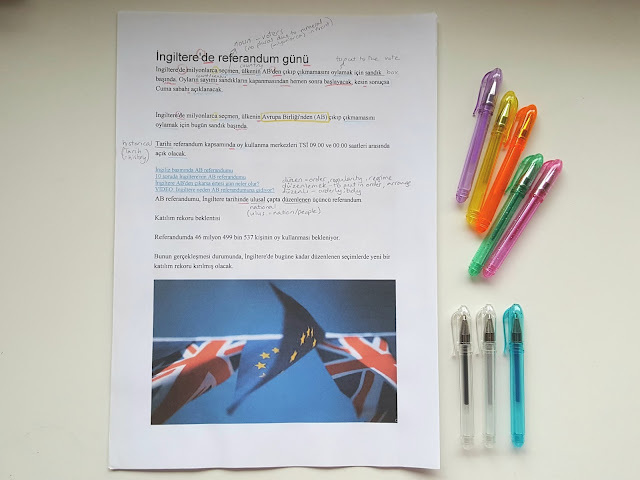 I will annotate the articles, writing down any new vocabulary I find as well as looking up any grammatical structures I have not come across before. I find watching TV in Turkish is a good way to practise my listening skills. If I hear a word I do not know I can look it up or guess the meaning from the context. 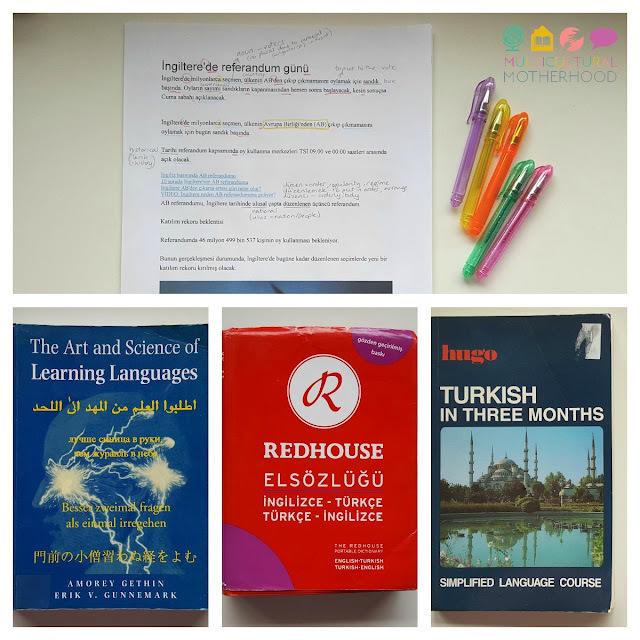 My Turkish comprehension is more advanced than my expressive language skills and it is a good way for me to pick up new vocabulary as well as tuning in to the pronunciation and intonation of the language. Finally, using your newly acquired skills to speak to native speakers of the language is crucial for improving your fluency. Therefore, I am going to make an effort to try and speak Turkish everyday. As my husband is a native speaker, I will try and speak Turkish with him in the evenings when he comes home from work. I am also going to introduce a set time each day that I speak Turkish with the children. This will most probably be at meal times. I am not only learning Turkish for myself but also my children. If my Turkish improves then so will theirs. 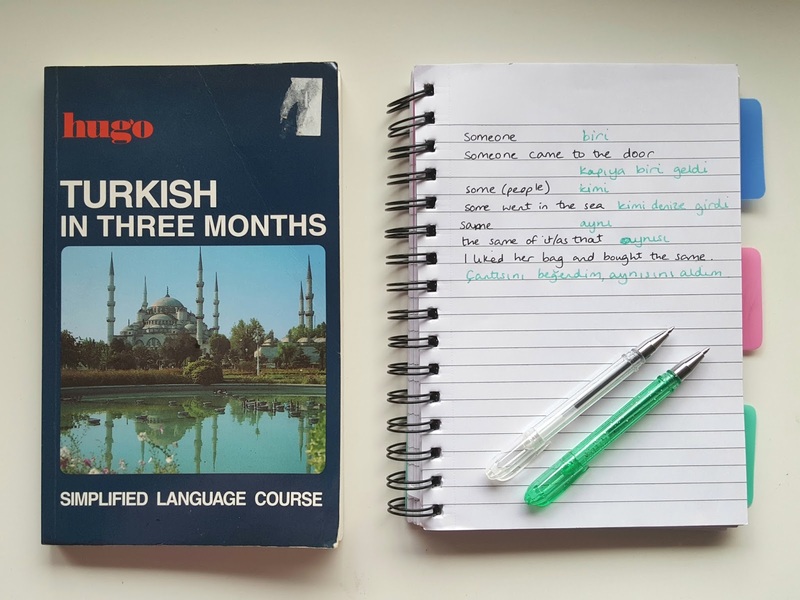 Additionally, I will try to spend more time with Turkish friends over the month so I have the opportunity to practise speaking Turkish with other native speakers. As you can see, I have a lot to do this month and I am sure this monthly goal will keep me very busy. I think the most important thing is to establish the habit of learning new vocabulary daily and this will take some time. In 2009 a study found that it can take between two to eight months to form new habits. Therefore, it is likely that I will be working on forming this habit for a good few months, however, by the end of the year I will hopefully be able to see some good results! We must start the new year as we mean to go on. Have you thought about any habits you would like to form this year? Do you have any goals for this month?